Hello again, and welcome to another Recipe of the Month Blog post! We are posting this in hopes that you have enough time to prepare and get this brewed for spring! This month, we will be focusing on one of the famous festbiers of Germany, Maibock (a.k.a. Helles Bock). Maibock, or Helles Bock (the two are largely considered the same, though the BJCP guidelines point out that Maibock is sometimes thought to hit the higher ends of the scales as far as color and alcohol go), is a bock bier to be sure, but is of a lighter golden color than its dark relatives, bock and doppelbock. Having a distinct grain character that comes from the pilsner base, it is clean, with no fruit character usually associated with esters, nor any butteryness from diacetyl. It should not be cloying or sweet, but rather should finish medium dry and be fairly easy to drink for its size. Hops can be more pronounced than the other bock styles, but hop flavor and aroma should still be kept to a minimum, if present at all. The main line with this beer style is that it is lighter in color and hoppier than the other subcategories of bock. Being a traditional German style, noble hops, especially those exhibiting spicy characteristics, can be used to craft wonderful examples of the style. And speaking of style examples, there are plenty! Many commercial examples flow out of Germany and make their way to the United States. Notable examples are from some of the larger breweries in Germany, including Ayinger, Hacker-Pschorr and Einbecker, though there are also some American breweries putting out fine examples of Maibock. Since crystal is out of the question for this style as it would leave more residual sweetness than we want, we will use pilsner as the base. We can then supplement that with some Munich malt for toasted flavor and color that works without making the beer too dark or sweet. This will leave us with a beer on the lighter side of the color spectrum for Maibock, but something that is delicious and drinkable for the higher alcohol content. For hops, we can use some Perle, a clean bittering hop with English parentage bred originally in Germany. While not one of the noble hops, it is clean and has a relatively high alpha acid content, meaning we can get more bittering by using less. We can then round out the hop character with a little bit of good ol’ Hallertau hops in the last 10 minutes of the boil. As this is a lager, we will need to pitch a ton of yeast and control temperatures well in order to get the clean, well-attenuated Maibock we are going for. We can use a nice Bavarian lager strain. 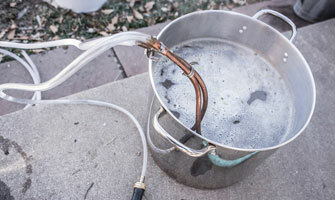 If you don’t have good temperature control, you can use a nice California Lager strain to make a clean beer on the lower end of ale temperatures. Also, note that the all grain version of this beer requires a 90 minute boil, so plan your volumes to account for the extra boiloff in the extended boil time! 1 oz. Hallertau hops (4.5%) added with 10 minutes left in the boil. This is a fairly large lager, and lagers need more yeast to fully attenuate and finish up properly. Use 2 to 3 “Pitch Right” cans (or make an appropriate starter) of Imperial Organic Yeast L02 Fest, or 4 to 5 packs (or make an appropriate starter) Wyeast 2206 Bavarian Lager yeast. If using a California Lager strain, use 2 to 3 “Pitch Right” cans (or make an appropriate starter) of Imperial Organic Yeast L05 Cablecar, or 4 to 5 packs (or make an appropriate starter) Wyeast 2112 California Lager yeast. Mash at 152F for 60 to 90 minutes. A mash-out at 168-170F for 15 minutes is recommended, but not necessary. Drain, sparge, and proceed with a 90 minute boil. The extended boil for the all-grain is to eliminate precursors to DMS, which can leave a vegetal, creamed-corn flavor in beers with a high proportion of pilsner malt. If using a lager yeast, chill to 48-52F, pitch yeast, and allow to ferment at 48-52F for 2 to 3 weeks. A diacetyl rest at 8 to 10 degrees higher than fermentation temperature is recommended for 2-3 days near the end of fermentation. Check the gravity, and perform the diacetyl rest when gravity has dropped 2/3 to 3/4 of the way to the expected final gravity. Once final gravity is reached, lager the beer for 2 to 6 weeks at 38-44F before bottling or kegging. If using an California Lager yeast, chill to 58-64F, pitch yeast, and allow to ferment at 58-64F for 2 to 3 weeks. Once final gravity is reached, proceed with bottling or kegging. A secondary fermentation for one to two weeks to improve clarity and reduce sedimentation is optional. Extract Version: While it is not going to be the exact same, this will give you a beer of similar starting gravity, with a slightly higher finishing gravity. Replace the Pilsner malt with 8 lbs of light dry malt extract and reduce the amount of Munich malt from 4 lbs to 2 lbs. Steep the Munich malt at 150-155F for 30 minutes using a muslin grain bag. Remove the bag, allowing the grains to drain into the boil kettle. Turn off the flame and dissolve the extract in the kettle. Turn the flame back on, bring to a boil and proceed as above. NOTE: as the extract version may be less fermentable than the all-grain version, you may experience a higher finishing gravity of roughly 1.018 when brewing the extract version.